Maria Margarethe Anna Schell (15 January 1926 – 26 April 2005) was an Austrian-Swiss actress. She ranged among the stars of German cinema in the 1950s and '60s. In 1954 she was awarded the Cannes Best Actress Award for her performance in Helmut Käutner's war drama The Last Bridge and in 1956 won the Volpi Cup for Best Actress at the Venice Film Festival for Gervaise. Schell was born in the Austrian capital Vienna, the daughter of actress Margarethe (née Noé von Nordberg; 1905–1995), who ran an acting school, and Hermann Ferdinand Schell (1900–1972), a Swiss poet, novelist, playwright, and owner of a pharmacy. Her parents were Roman Catholics. She was the older sister of actor Maximilian Schell and lesser-known actors Carl Schell and Immy (Immaculata) Schell. After the Anschluss in 1938, her family moved to Zürich in Switzerland. Maria Schell began commercial training, but soon entered the film business when she met the Swiss actor and director Sigfrit Steiner. Schell premiered in Steiner's 1942 film Steibruch, side by side with the well-known Swiss actor Heinrich Gretler, and took acting lessons for several theatre engagements. After World War II, she was cast in her first leading role in the 1948 film The Angel with the Trumpet, directed by Karl Hartl. She starred in such films as The Magic Box, Dr. Holl (1951), So Little Time (1952), The Heart of the Matter (1953). Her emotional acting earned her the nickname Seelchen ("little soul"), coined by her colleague Oskar Werner. The 1956 film Gervaise directed by René Clément was also a nominee for the Academy Award for Best Foreign Language Film; while in Hollywood, Schell met with Yul Brynner, who urged for her casting in The Brothers Karamazov (1958) in the role of Grushenka. Schell also starred with Gary Cooper in The Hanging Tree (1959) and with Glenn Ford in Cimarron (1960). Other famous movie parts included Le notti bianche (1957), Rose Bernd (1957), and Superman (1978). Schell played Mother Maria in the sequel to Lilies of the Field called Christmas Lilies of the Field and starred opposite such actors as Marcello Mastroianni, Suzy Delair, and Marlon Brando. In 1976 she starred in a Kojak episode and also had three guest appearances in the German television series Der Kommissar and two in Derrick, in the episodes "Yellow He" (1977) and "Klavierkonzert" (1978). Schell also appeared on stage, including an acclaimed performance in the 1976 Broadway play Poor Murderer by Pavel Kohout and the leading role in Friedrich Dürrenmatt's play The Visit with the Schauspielhaus Zürich ensemble. Schell was married twice, first to film director Horst Hächler (divorced in 1965) and second to director Veit Relin (divorced in 1986). Her daughter by her second marriage, actress Marie Theres Relin (born 1966), was married to Bavarian playwright Franz Xaver Kroetz and has three children; she made a media and internet appearance as a spokeswoman for housewives (If Pigs Could Fly. Die Hausfrauenrevolution, 2004). Maria Schell's last years were overshadowed by her ill health. She attempted suicide in 1991 and suffered repeated strokes. Her final public appearance was at the premiere of her brother Maximilian's documentary film, My Sister Maria (2002) on her life; both were awarded the Bambi Award for their work. 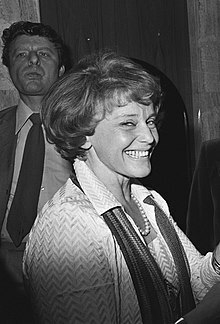 Schell lived reclusively in the remote village of Preitenegg, Carinthia in the Austrian Alps until her death from pneumonia on 26 April 2005, aged 79. Upon her death, her brother released a statement, saying in part: "Towards the end of her life, she suffered silently and I never heard her complain. I admire her for that. Her death might have been for her a salvation. But not for me. She is irreplaceable." 1985: Die Kostbarkeit des Augenblicks. Gedanken, Erinnerungen. 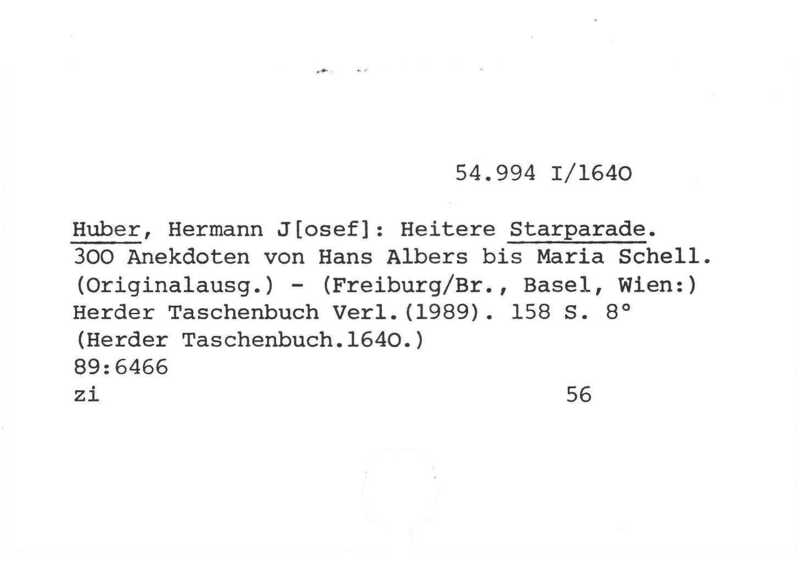 Langen Müller, München, ISBN 3-7844-2072-9. 1998: „... und wenn’s a Katz is!“ Mein Weg durchs Leben. Lübbe, Bergisch Gladbach, ISBN 3-404-12784-6. ^ "Reply to a parliamentary question" (pdf) (in German). p. 1495. Retrieved 18 January 2013. Wikimedia Commons has media related to Maria Schell. This page was last edited on 18 December 2018, at 00:59 (UTC).